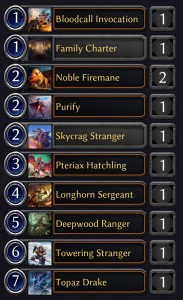 I finally got around to playing out the rest of my ranked matches for the April sealed league right about 9pm on April 30th. 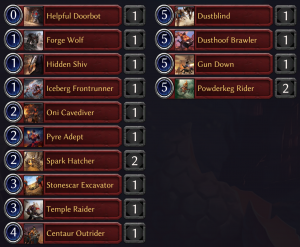 While the deck began as one I was excited about, I became less and less excited to play it as the weeks wore on and my packs failed to deliver anything exciting. For May’s league, DWD announced that we’ll be getting two packs per week instead of one, which is a welcome change. Hopefully we’ll get to see our decks make some meaningful leaps throughout the month this time around. My best shot to win with this deck was to pray that I had some cheap units to go with the myriad relic weapons. I absolutely had to gain tempo on my opponent and at least get them within striking distance of a Flame Blast or Flight Lieutenant kill. Games where I fell behind quickly became hopeless if my opponent had any reasonable ways to keep the pressure up on me. Relic weapons are incredible when you’re ahead because they not only trade 1-for-1 with your opponent’s units, but they also open up attacks with your own units so you can really pressure your opponent’s life total. However, when you have to use a Magma Javelin to kill a 4/4 while still winding up behind on the board, you’re just toast. Yeah, you killed their thing, but you took effectively 3 damage to do so, and you’re going to get attacked to boot. Moreover, in a deck like this which basically has zero ways to kill a unit with more than 4 health (barring warcries landing on my relic weapons), even if you keep the board at parity with your relic weapons, you still are likely to wind up losing the long game. I started 8-8 before playing my remaining games (though 17-3 in my tiebreaks, which is pride I will take to my grave, even if they didn’t count at all). In the 24 games I played, I went 13-11. Not spectacular. That put me at 21-19 overall, just barely over 50%. It put me comfortably in the top 5000, but without any shot at top 1000, so I didn’t bother with any tiebreaker games. If you count my tiebreaks (pride! 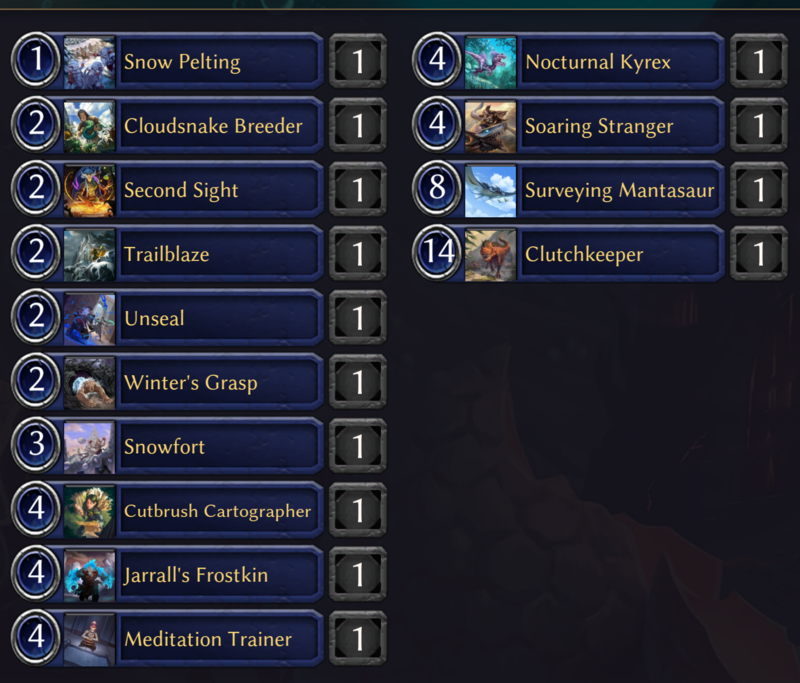 ), I went a total of 38-22 with this deck, which is quite good. I just didn’t pick a great time to do my winning. Silly me. 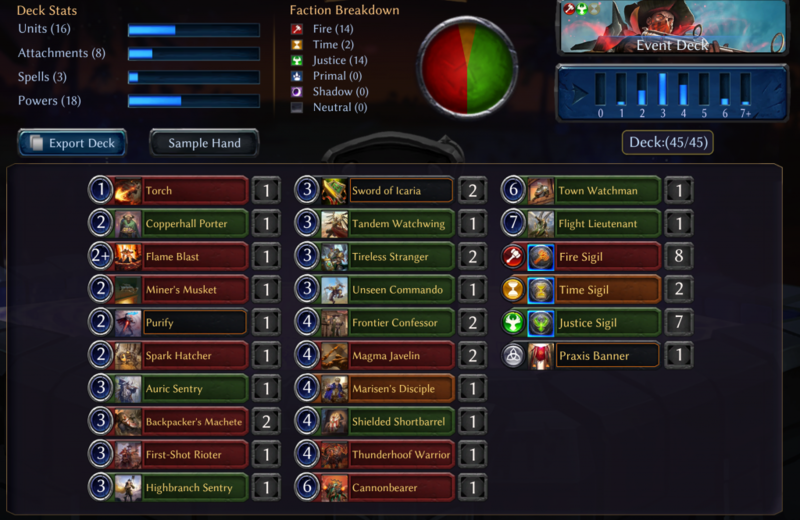 I do think the deck was solid, but it did break one of the cardinal rules I outlined in my first sealed article: Don’t be aggressive unless you absolutely have to. I do think the pool backed me into that corner, as I had no removal or great bombs in other factions. Still, I think I definitely could have hit top-1000 with a little extra luck. My problem was that I didn’t even do aggression that well, with the lack of units. A few more 2-drops to go with my relic weapons would have gone a long way. Playing a 3/2 on 2 and then removing their blockers turn after turn with my weapons would have been a great game plan. I just didn’t have that option. 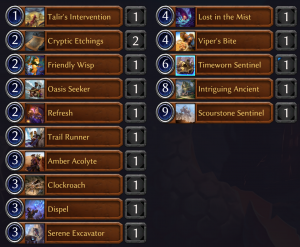 One thing I did notice was many of my opponents playing straight-up 3-faction decks, which I suppose shouldn’t have been too surprising with how weak Sets 2 and 3 can be. Maybe that’s the way to go. Maybe I should have just gone deep on Time and played some of the greedier cards like Frenzied Omnivore. Maybe not. At the end of the month, I’m content with how I built the deck, I think, but there’s definitely an argument to be made for getting greedier. I abandoned my typical process for this pool. Can you guess why? It’s because Justice was about twice as deep as any other faction. There’s just no way I don’t wind up base-J with those cards. 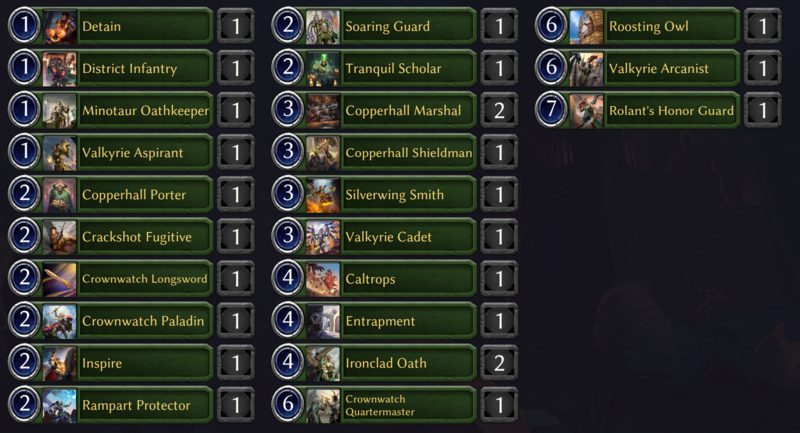 I’ve got two sweet bombs in Rolant’s Honor Guard and Crownwatch Quartermaster, as well as a solid number of cheap units and some nice late game power outside of my bombs. My building process simply became a competition to see which faction(s) paired best with Justice. So what do the other factions have on offer? Well, Fire doesn’t have much beyond Gun Down. I could definitely splash that, however. It’s a solid removal spell that can deal with larger threats. It’s got a few solid 2s in Oni Cavediver and Spark Hatcher, but those aren’t enough to draw me into the faction completely. Likewise, Time doesn’t have anything incredible, but it does have some very solid options, including an Amber Acolyte, which will help with any potential splashes. Clockroach is a decent card by itself, as the first one will buff the second, meaning you wind up with a 2/2 and a 3/3 in one card. Not the best for 6 power, but also still quite reasonable. Refresh is an excellent combat trick because the health buff sticks around. Trading it for a removal spell or an opposing combat trick feels great. Oasis Seeker is a pretty good 2-drop as far as those go, and Dispel is a reasonable way to deal with opposing flyers. None of these are particularly exciting, but remember that Justice is incredibly deep and I just need to fill in holes here and there to make my deck tick. 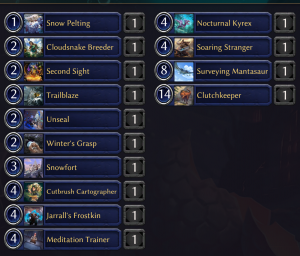 Primal has Snow Pelting and Jarrall’s Frostkin, but it doesn’t have any yetis to go with the Pelting, and none of the other cards are exciting. Pelting is playable even without Yetis, but I’m not gonna splash for it just to deal 2. Frostkin is a little more exciting, but you need to be able to deploy him on curve to really get the benefit of his tempo. 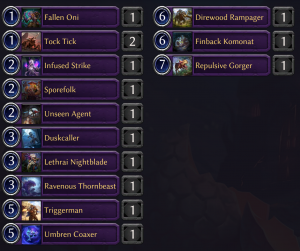 Even if I had a few dinos, Clutchkeeper is just too expensive. I think they were too conservative in costing her, to be honest. You have to have a pretty damn stacked dino to even be able to play mama-saur, but if you’ve got a dino with 6 attack, why aren’t you beating down? Shadow is just…garbage. 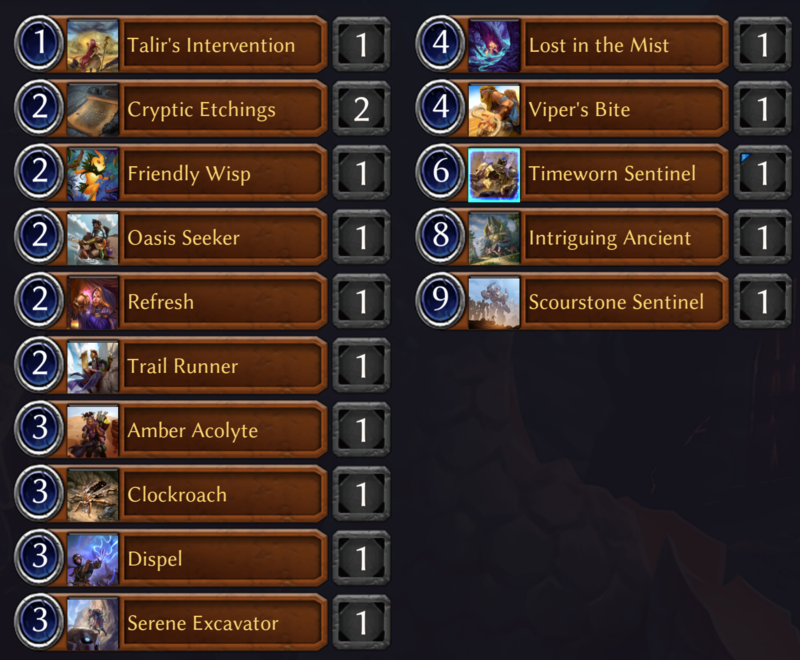 Tock Ticks are cute with Clockroach, but where’s the removal?! That’s shadow’s main strength, and there just isn’t any. At all. Not even an Affliction. Barf. My multifaction/neutral situation is interesting. Praxis gives me Purify and two copies of Noble Firmane. However, I don’t think the Firemanes are very good in sealed, as your deck simply won’t be focused enough to take advantage of the ability, and I won’t be able to play them on 2 in my base-Justice deck. Purify is another thing I could splash, if I wind up playing Time with the Amber Acolyte. 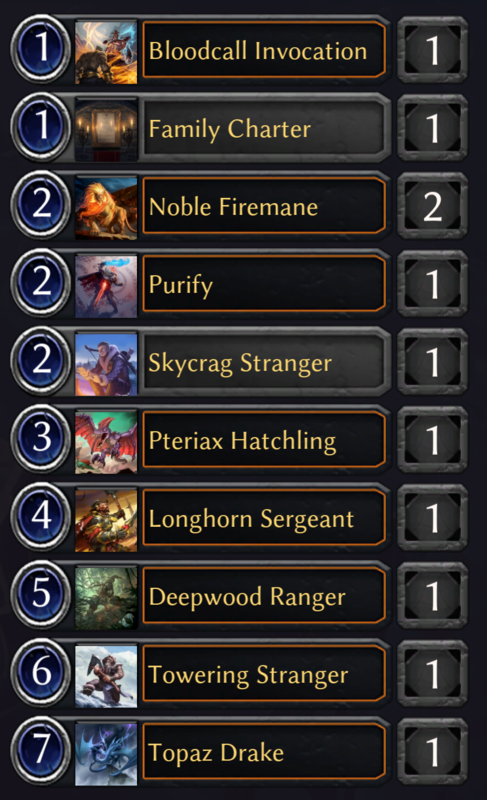 Skycrag Stranger would help me splash either Fire or Primal. Glad to have a faction stranger this time around. Pteriax Hatchling is an incredible card, and one I’m very keen to try and play if at all possible. It’s just everything you want in a sealed unit. Flyer? Check. Card advantage? Check. Flexibility on curve? Check. Longhorn Sergeant is fine. If I was to play Rakano, he’d make the cut, but I don’t think I’m going to splash for him. I’m all about warcry, but it takes some work to line up a spot where a 4-cost 2/4 gets to attack, which makes him not quite worth the splash. Deepwood Ranger isn’t going to get there. Towering Stranger is huge, and I’d play it if I was Skycrag for sure, but I don’t think I’m in for a double-splash. Same with Topaz Drake. I love the big 5/3 charge flyer, but I’ve already got a couple expensive flyers. Though this one closes out the game very quickly, I don’t think it’s quite powerful enough to stretch my faction base to play. Rolant’s Honor Guard can completely turn a lost game around. This guy can’t quite do that, and only having 3 health exposes it to a lot of removal. Family Charter is a card I’ll play if I need a 28th playable, but I’m not thrilled. It goes up in value if I don’t have other mana sinks, but considering I’ve got a Crownwatch Quartermaster and a bunch of other 6+ drops, I’m good on big mana sinks. Ultimately, the pool is very, very light on removal. Unlike my last pool, where I was actually flooded with relic weapons, I don’t have a single one here. Justice has a ton of solid units and a couple of combat tricks, but only Entrapment for removal. That alone pushes me toward playing FTJ for Gun Down and Purify to help out. Adding Refresh and Dispel gives me a couple more decent ways to interact. The final question is: Do I splash the Pteriax Hatchling on top of the Fire cards? I do have that Skycrag Stranger which is essentially a “free” primal source, since I would have played it for the Fire splash anyway. Amber Acolyte is another source. Adding one Primal Sigil would give me three sources for a single card. That seems reasonable to me. I’ll give it a shot for a few games, at least. One final card I considered was the Family Charter. 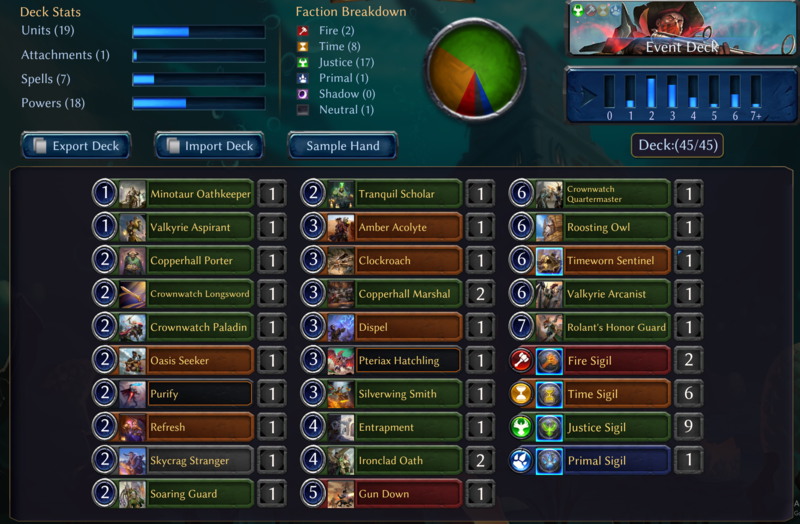 I wasn’t high on it earlier, but if I am going to splash two factions, it might be worth playing for both the early scout to help me find my power and the later-game digging for a missing faction. The counterpoint to that is that, by adding Pteriax Hatchling, I am upping my individual card quality, so I don’t need to draw extra cards to out-value my opponent. My cards should (hopefully) be more powerful overall, so going 1-for-1 with them should favor me. In theory, anyway. It’s choices like this that really make me long for a best-of-three mode in Eternal. Being able to bring in something like Family Charter in matchups where it would shine would go a long way to making borderline cards like Charter see more play. 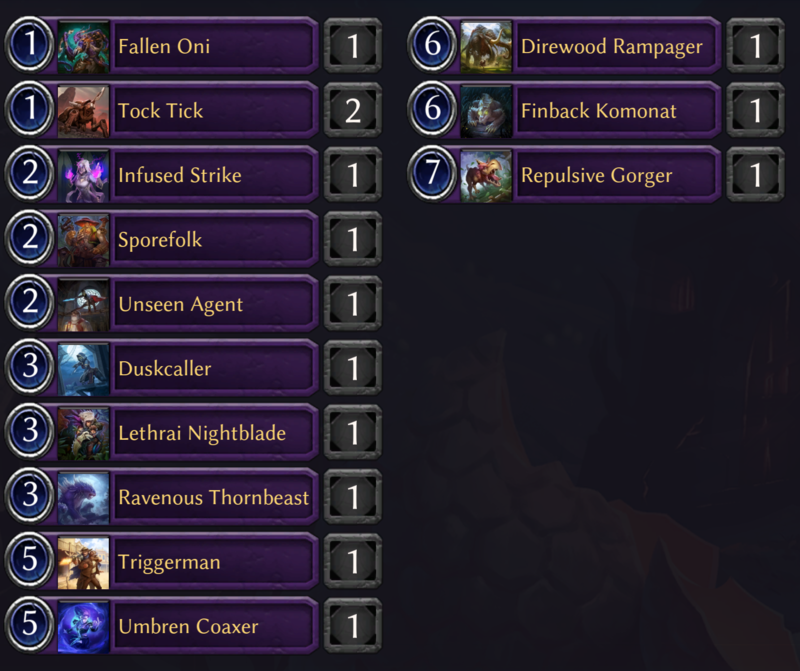 This deck has some beef and some nice defensive tools, as well as some cheap flying dorks to go over the top. It’s going to be weak to large ground-pounders, so I’ll have to be careful with spending my Entrapment and Ironclad Oaths, since I may need them to help stabilize a board. If I can avoid getting overpowered early on the ground, I should be able to get in enough chip shots with flyers to win. I’m not thrilled with Soaring Guard or Silverwing Smith. However, I have a few ways to make them better in Longsword, Minotaur Oathkeeper, Crownwatch Paladin, and Roosting Owl. Plus, Crownwatch Quartermaster does have the Valkyrie Ally ability, which can help stabilize a board long enough to get his activated ability going. They will hopefully be the first cards cut (unless I open some nice relic weapons), but they should be serviecable for now. 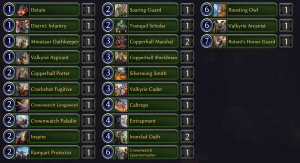 The power base is obviously a little shaky, playing 4 factions, but I think it’s good enough. I’m only actually splashing three cards, so I may have a dead card here or there, but I should be okay even if that happens because the card quality in this deck is quite high. That’s the plan, anyway. 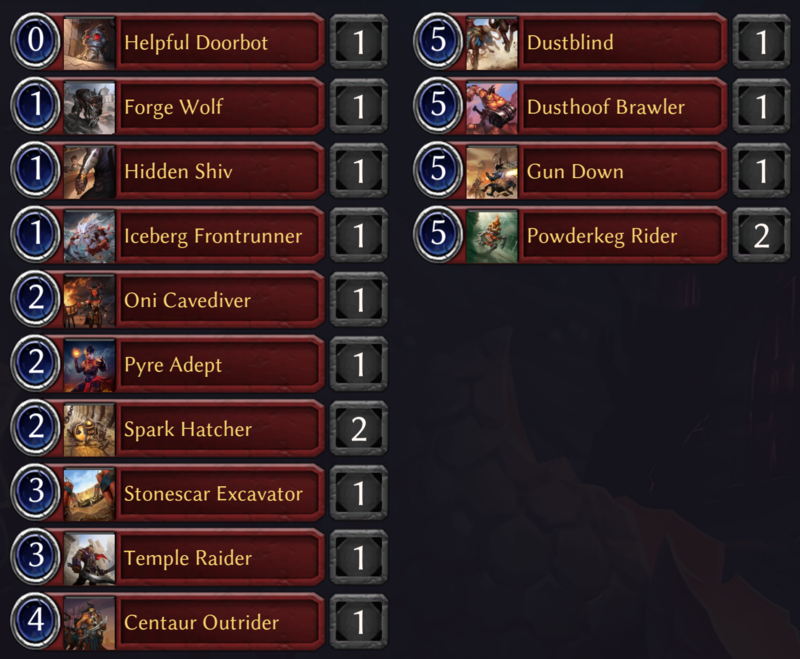 So that’s my deck for this week! I’ll report back once I’ve played a few matches and discuss what I opened out of my Set 3 packs. I’m hoping for some Trail Makers, Omnivores, and Entrapments!